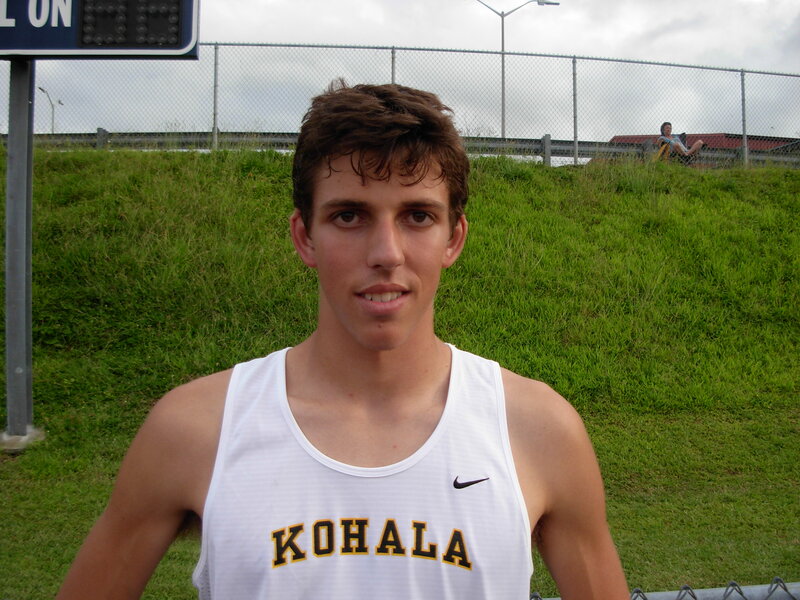 Kohala is a quant, quiet little village on the north end of the island, but something must be going on as they have produced two of the finest high jumpers in high school track. Ethan Meikle and Kelson Kawai are making a name for themselves as the Cowboys from Kohala are leading the Big Island Interscholastic Federation for their ability to leap over a cross bar. 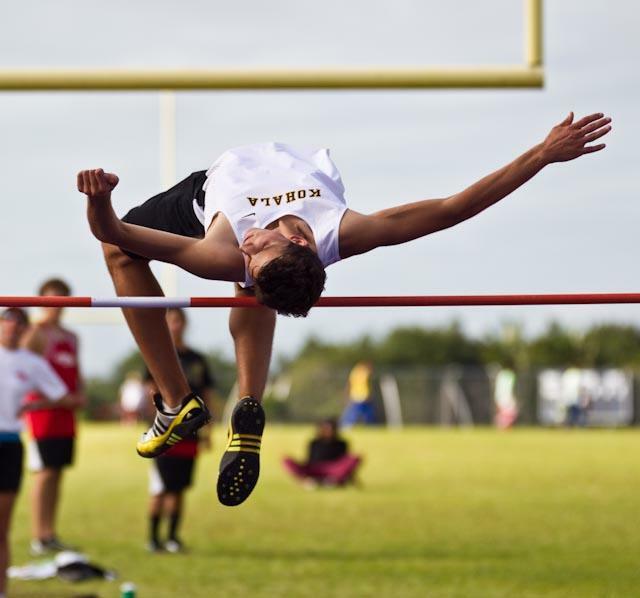 While most of the high jumpers in the BIIF are struggling to clear 5’ 10” the Kohala duo jumped 6’ 2” on their first attempt this past Saturday at Keaau. Meikle, who stands at 6’ 2”, cleared his own height for the first time in his track & field career. “My previous best this season was 6’ 1” and last season I couldn’t go higher than 5’ 10”,” he said. Coaching Meikle and Kawai is Maria Bunyi who admits to being a student of the high jump. “I only started learning about high jump two years ago when the boys showed an interest in trying it,” she said. Since that time Bunyi has read everything she could on the high jump and has introduced a variety of drills to improve technique. Besides working on a variety of polymeric skills Bunyi has also gotten the duo to take part In 90 minute yoga sessions twice per week to improve flexibility. 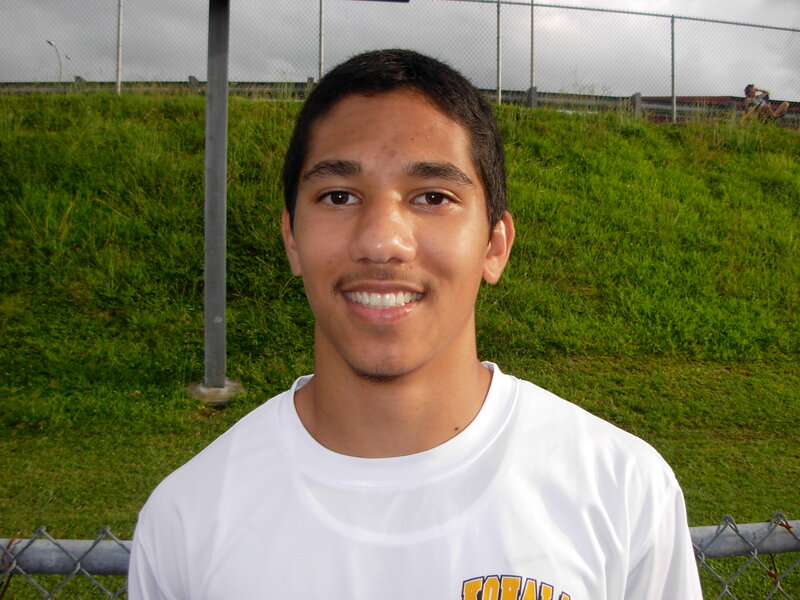 Kawai, who stands at 5’ 7”, cleared 6’ 2” earlier in the season before injuring his foot in the triple jump. “I needed to take a couple weeks off to allow that injury to heal,” he said. But after clearing 6’ 2” on his first try Kawai checked into the triple jump event and on his first jump reinjured his foot. While teammate Meikle was attempting to clear 6’ 4” Kawai could only watch as he limped across the field. Both Kawai and Meikle lead the BIIF in the high jump and are tied for fourth in the state with their 6’ 2” clearance. 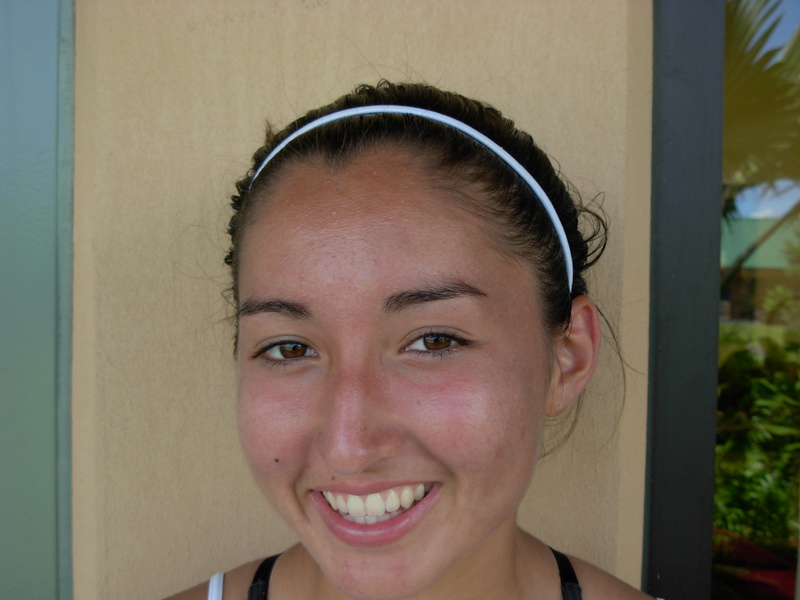 But Kawai believes that in order to win the state championship they will need to go a lot higher. 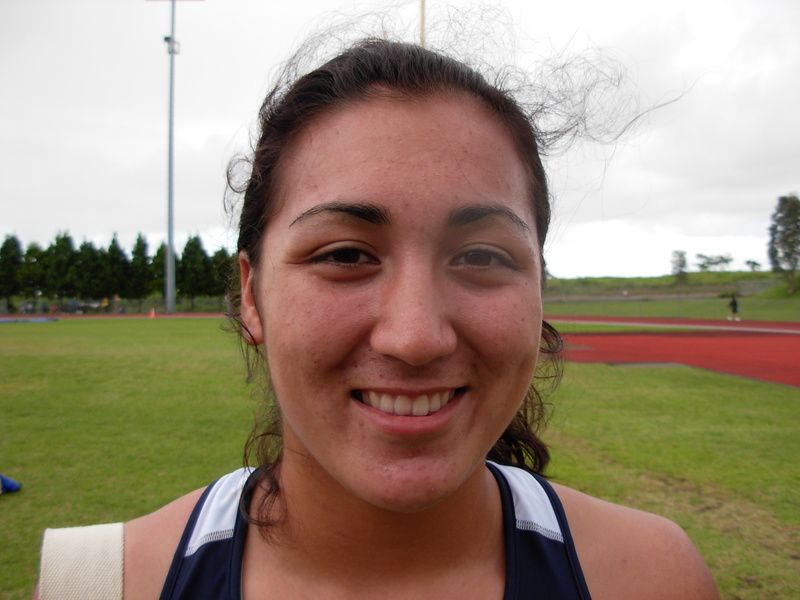 On the track it was Honokaa’s Tialana Greenwell winning both distance races in convincing fashion. Greenwell, who has struggled during most of the track season, is the three time BIIF cross-country champion. 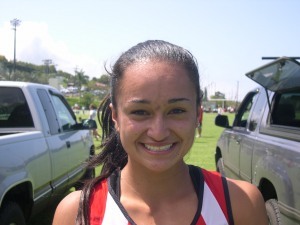 But on Saturday it was the old Greenwell emerging to first win the 1500 meter run in 5 minutes 15.33 seconds with Hilo’s Traci Palermo and Keaau’s Deann Nishimura-Thornton close behind. Then later in the evening Greenwell led the 3000 race from start to finish with teammate Athena Oldfather trying to keep pace, winning in the leagues fastest time of 11:36. “I know I need to work a little harder to get to states, but after today my confidence is back and it feels good,” Greenwell said. 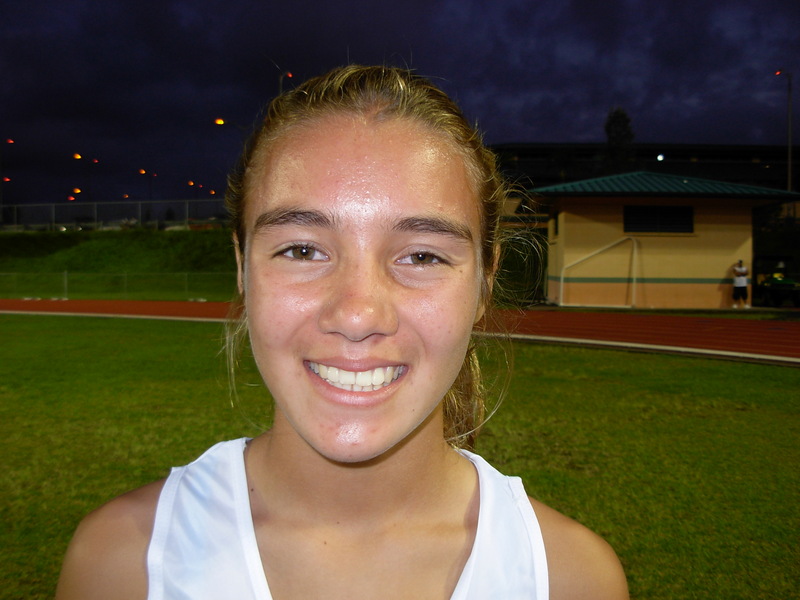 In a surprise race it was relative unknown, Konawaena freshman Ua Ruedy, running the girls 300 meter hurdles for the very first time and winning the event in 49.37 seconds, the fastest time in the BIIF this season. Ruedy ran the 300 like a seasoned runner and didn’t miss a beat going over each hurdle on her right foot to lead the league on her very first try. One of the best races of the day came towards the end of the venue when the boy’s 200 meter dash featured some of the fastest runners on the island. Waiakea’s Ka’imi Scott got out of the blocks perfectly and pulled away from the talented field in the first half of the race. During the final 100 Keaau’s Jesse Huihui came flying down the straight away to pull up to Scott’s shoulder and out of nowhere came Kau’s Jacob Edwards with a fierce kick. Edwards, who earlier recorded the best triple jump distance in the state, had a slow start out of the blocks and looked to be out of the race, but the gritty senior made it a three way affair in what was a photo finish at the line. Three one-hundredths of a second separated the three talented sprinters with Scott (22.47) getting the win followed by Edwards and Huihui. All three boys made state qualifying time for the 200. 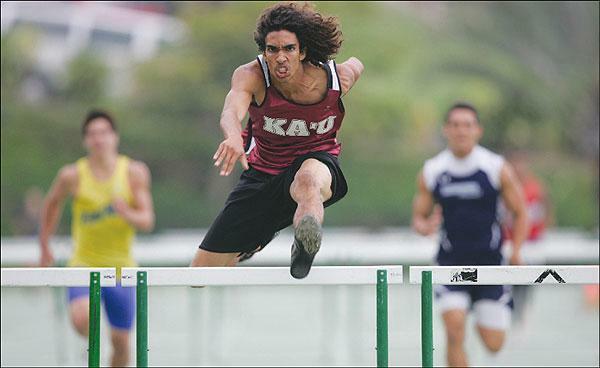 This Saturday the BIIF will conclude its regular season with an all-schools meet at Keaau. Field events began at 2 pm with running events starting at 3 pm.